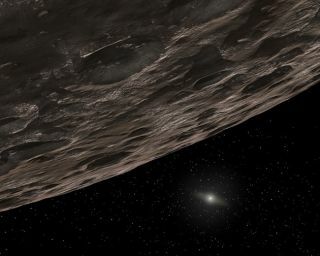 Artist's concept of a Kuiper Belt object, circling the sun beyond Neptune's orbit. The reddish hue of many objects in our solar system's frigid outer reaches may be evidence of complex organic molecules, perhaps even the building blocks of life, new research suggests. If the model is correct, it would support current theories that organic materials might be common in the universe, researchers said. "We're not saying that life is produced in the Kuiper Belt," said physicist John Cooper of NASA's Goddard Space Flight Center in Greenbelt, Md. "But the basic chemistry may start there, as could also happen in similar Kuiper Belt environments elsewhere in the universe, and that is a natural path which could lead toward the chemical evolution of life." About 1,000 Kuiper Belt objects have been directly imaged so far, and these bodies appear to be a wide range of colors, from red to blue to white, researchers said. Since these objects are so far away — the Hubble Space Telescope sees most of them as just a single pixel of light — scientists had developed few theories to explain the colors. But the new computer model maps out the right combination of materials and space environment that could produce some of those hues. It found that the Kuiper Belt objects likely have many different layers. "This multi-layer model provides a more flexible approach to understanding the diversity of colors," Cooper said. "The model calculates the rate at which energy comes in from radiation and could be causing changes at different depths. So we can define different layers based on that." The layers may have different colors, and could also be dynamic. For example, a deeper layer of relatively pure water ice could erupt to form a new uppermost layer, perhaps accounting for the bright, icy surface of Eris, the largest of the known Kuiper Belt objects. Cooper presented his model in October at the Division for Planetary Sciences meeting of the American Astronomical Society in Pasadena, Calif.
Kuiper Belt objects come in a wide range of colors, sizes and orbits. One group, called the Cold Classical Kuiper Belt, is aligned in nearly the same plane as the planets and has relatively circular orbits. While objects in much of the Kuiper Belt run the color gamut, Cold Classical bodies are consistently reddish, Cooper said. The first thing Cooper's model had to explain was why Kuiper Belt objects don't sport a thick black crust from radiation exposure. He believes that the Cold Classicals formed in a sweet spot where plasma ions from the sun aren't intense enough to overcook the outermost surface. Instead, the plasma ions have just "sandblasted" off the topmost surface layer, which is perhaps a millimeter thick. Additional erosion could come from impacts of tiny dust grains ejected into the Kuiper Belt region when nearby larger objects collide. That means, the model suggests, that the red color must be from the exposed second layer. This second layer may be gently cooked by radiation from interstellar space, according to Cooper. In turn, this cooking effect could transform water ice, carbon, methane, nitrogen and ammonia — the basic substances believed to be on these bodies — into organic molecules containing oxygen and carbon, such as formaldehyde, acetylene and ethane. "If there wasn't any cooking at all, we would just see primordial ice, and the object would appear bright and white," Cooper said. "And if there was too much radiation we would just see black crust." Cooper's layer model can account for white Kuiper Belt objects as well. Beneath the red stuff, a layer of water ice could volcanically erupt through the crust onto the surface, generating bright-white coats. At this point, the layer model is based on limited data from the Voyager mission that provided information on the energy levels of radiation beyond Neptune. NASA's New Horizons mission spacecraft will pass through the Kuiper Belt region beyond Neptune's orbit in 2014, getting a good look at Pluto and its largest moon Charon in 2015 — and one or two other objects later if all goes well. Cooper hopes New Horizons will pass close enough to another Kuiper Belt object to make detailed observations of its surface, which would help confirm what materials are present. New Horizons can provide additional verification by confirming that the energy distribution and particles in this region of the solar system jibe with what the model requires. If the model is borne out, its findings support the argument that the building blocks of life could be widespread in our solar system and perhaps the universe, researchers said. "When you take the right mix of materials and radiate them, you can produce the most complex species of molecules," Cooper said. "In some cases you may be able to produce the components of life — not just organic materials, but biological molecules such as amino acids."